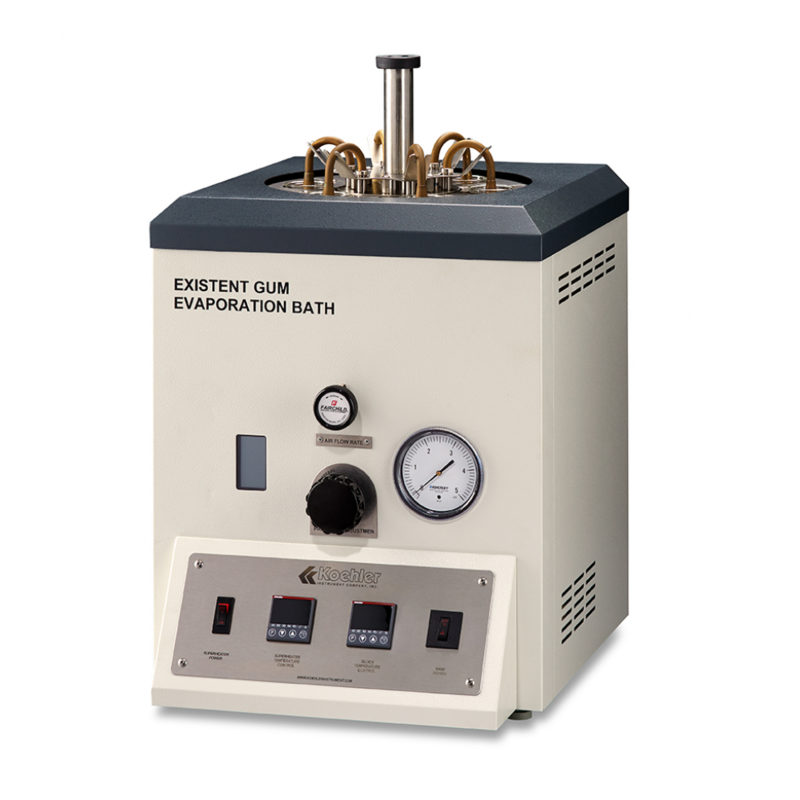 Existent Gum Evaporation Bath – Koehler Instrument Company, Inc.
Gum formed during fuel storage can deposit on induction system surfaces, intake valves, stems and guides. To test for gum content, a 50mL sample is evaporated in an aluminum block bath for a specified period under controlled conditions of temperature and flow of air (aviation and motor gasolines) or steam (aircraft turbine fuel). 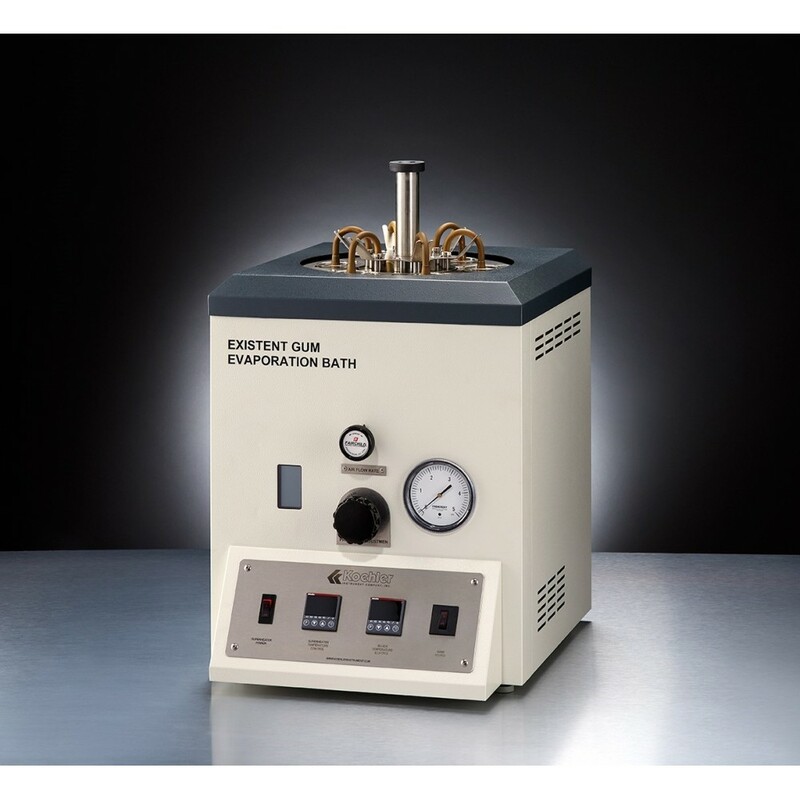 Electrically heated baths for determining existent gum in aircraft turbine fuels by steam-jet evaporation and in motor and aviation gasolines by air-jet evaporation. Fully insulated, aluminum block design assures safe, efficient high temperature operation. Equipped with air/steam pressure regulator with gauge and a digital flowmeter for adjusting air flow per ASTM specifications. Stainless steel jets deliver air or steam flow to the test wells through removable brass conical adapters. Microprocessor PID control provides quick temperature stabilization without overshoot, and the bath is protected by an overtemperature control circuit that interrupts power should bath temperature exceed a programmed cut-off point. Dual LED displays provide actual and setpoint temperature values in °C/°F format. Model K33900 with Built-in Superheater–Six-unit bath with a built-in thermostatically controlled superheater which delivers dried steam to the bath inlet for steam-jet method testing of aircraft turbine fuels. Has digitalindicating solid state bath temperature control with digital setpoint and display. Model K33780–Three-unit bath without built-in superheater. All controls are housed in the bath cabinet. For steam-jet method testing of aircraft turbine fuels Meets output requirements of three-unit and six-unit evaporation baths Electrically heated for clean, efficient operation and ease of installation Meets applicable ASME, NEC standards; UL listed, CSA approved Electrically heated boiler provides instantaneous and reserve steam capacity for steam-jet evaporation tests. Easy to install and operate; electrical heating eliminates the need for on-site fuel combustion. Requires only a water feed source and electrical hook-up. Ruggedly constructed, with long life industrial grade incoloy heating element. Includes a full range of safety features: automatic water level control and low water cut-off; steam safety valve; high-limit pressure cut-out with manual reset; steam pressure gauge.